What’s Bollywood without some good ol’ drama? 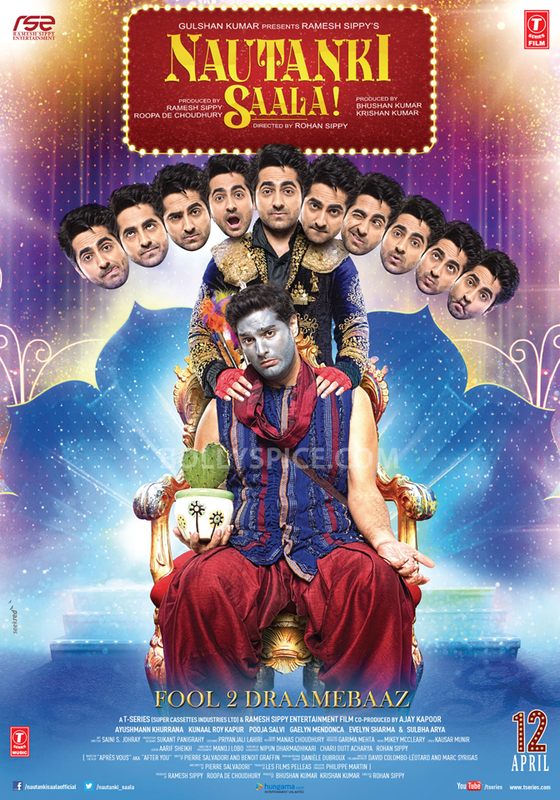 One-film old Ayushmann Khurana and Kunaal Roy Kapoor come together in Rohan Sippy’s Nautanki Saala. Each had successful acclaim-worthy debuts with Vicky Donor and Delhi Belly respectively. Add to it the mythological tale of Ramayan done Broadway style and Nautanki Saala is an immensely tempting proposition. So it remains to see whether it was beginners luck or can they both prove their mettle once again with their new release in this unique set up. Find out. Ram Parmar aka RP (Ayushmann Khurana) is the actor-director of a successful theatre production RaavanLeela. When he is not enacting Raavan in his play on-stage, he is embodying a good-hearted Ram who nurtures an incessant desire to help anyone and everyone on the brink of trouble. This trait leads him to rescuing Mandar Lele (Kunal Roy Kapoor) who is on verge of committing suicide owing to a relationship with Nandini (Pooja Salvi) gone kaput. Despite an exasperated girlfriend Chitra’s (Gaelyn Mendonca) disapproval, RP takes it upon himself to fix Mandar’s life including a patch-up with his lost love. Ayushmann high on his award winning spree fills in sufficient meat to keep the audience entertained as does Kunaal Roy Kapoor who plays the bumbling idiot equally, if not more, effectively. The camaraderie between the two male leads is endearing as the former plays ‘guardian angel’ to the latter. This subsequently works as a pitfall for scenes with the female leads where they are unable to match the tone and energy set by their male co-stars. Of the three female characters, Pooja Salvi who plays the pivotal part in the film is the weakest, looks confused, utters dialogues with zilch expressions and comes across as under rehearsed. She is easily overshadowed by the supporting cast of Evelyn Sharma (good screen command) and Gaelyn Mendonca who with the smaller roles are likeable. Special mention to Sanjeev Bhatt (theatre producer Chandra), who with his quirky twang makes some of the otherwise dull sequences, enjoyable. The first half flies by establishing the characters and laughing along with them at their genuine gimmicks and plights. Some of the best lines, which were already part of the promos, are used up by interval with not much going on for the second half. Abhishek’s cameo is well played; sequence with caricatured Japanese tourists is brilliant. Director Rohan Sippy along with writers Nipun Dharmadhikari and Charu Dutt Acharya sketch an interesting parody of reel life Raavan embodying real life Ram and the mix-ups that ensue thereon. The concept that every Raavan has a Ram side to him and vice-versa is interpreted effectively on screen and I particularly liked the treatment of the theatre set up running parallel to the real lives of its actors. But where there is a Ram-Raavan there is a Sita whose track here unfortunately is loosely scripted and the film then goes off-balance. As solid is the Ram-Raavan equation, it’s as difficult to reason the infatuation with Sita. So when the focus post interval shifts to the love multi-angles instead; all logic is suspended beyond repair. At a run time of 2 hours, Nautanki Saala is a vicious cycle of swallowing the inconsistent soppy romances, hoping you don’t throw up, to waiting for the funny bits to come and trying to hold on to them as long as possible. The movie is plagued with the ‘good idea, shoddy narrative’ syndrome. At the outset the core idea of half good-half evil is a brilliant theme and the filmmaker should have simply banked on it, but instead they pile up nau-tanki (nine barrels) much melodrama that you echo the characters sentiments ‘isse toh suicide easy tha (suicide is easier than this)’. So repeat after me… ‘yahaan sab hai cheater, haan sab hi lagatey hai vaat… bas ek sorry kaafi’. 17 queries in 0.583 seconds.